1 A None No Power Seat 1 A is a standard Business Class seat located at a bulkhead that transforms into a fully flat bed. The close proximity to the galley and lavatory area might be bothersome. 1 B None No Power Seat 1 B is a standard Business Class seat located at a bulkhead that transforms into a fully flat bed. The close proximity to the galley and lavatory area might be bothersome. 1 D None No Power Seat 1 D is a standard Business Class seat located at a bulkhead that transforms into a fully flat bed. The close proximity to the galley and lavatory area might be bothersome. There is also limited overhead storage space due to the pilot rest bunks accessed in the center column. 1 E None No Power Seat 1 E is a standard Business Class seat located at a bulkhead that transforms into a fully flat bed. The close proximity to the galley and lavatory area might be bothersome. There is also limited overhead storage space due to the pilot rest bunks accessed in the center column. 16 A None No Power Seat 16 A is a standard Economy Plus seat that has extra legroom due to the position of the bulkhead however, the position of the bassinet may be bothersome. This seat has no overhead storage space. 16 B None No Power Seat 16 B is a standard Economy Plus seat that has extra legroom due to the position of the bulkhead however, the position of the bassinet may be bothersome. This seat has no overhead storage space. 16 C None No Power Seat 16 C is a standard Economy Plus seat that has extra legroom due to the position of the bulkhead however, the position of the bassinet may be bothersome. This seat has no overhead storage space. 16 D None No Power Seat 16 D is a standard Economy Plus seat that has extra legroom due to the position of the bulkhead however, the position of the bassinet may be bothersome. This seat has no overhead storage space. 16 E None No Power Seat 16 E is a standard Economy Plus seat that has extra legroom due to the position of the bulkhead however, the position of the bassinet may be bothersome. This seat has no overhead storage space. 16 F None No Power Seat 16 F is a standard Economy Plus seat that has extra legroom due to the position of the bulkhead however, the position of the bassinet may be bothersome. This seat has no overhead storage space. 16 J None No Power Seat 16 J is a standard Economy Plus seat that has extra legroom due to the position of the bulkhead however, the position of the bassinet may be bothersome. This seat has no overhead storage space. 16 K None No Power Seat 16 K is a standard Economy Plus seat that has extra legroom due to the position of the bulkhead however, the position of the bassinet may be bothersome. This seat has no overhead storage space. 16 L None No Power Seat 16 L is a standard Economy Plus seat that has extra legroom due to the position of the bulkhead however, the position of the bassinet may be bothersome. This seat has no overhead storage space. 24 A None No Power Seat 24 A is a standard Economy Plus seat however, the proximity to the lavatories and galleys may be bothersome. 24 B None No Power Seat 24 B is a standard Economy Plus seat however, the proximity to the lavatories and galleys may be bothersome. 24 C None No Power Seat 24 C is a standard Economy Plus seat however, the proximity to the lavatories and galleys may be bothersome. 24 D None No Power Seat 24 D is a standard Economy Plus seat however, the proximity to the lavatories and galleys may be bothersome. 24 E None No Power Seat 24 E is a standard Economy Plus seat however, the proximity to the lavatories and galleys may be bothersome. 24 F None No Power Seat 24 F is a standard Economy Plus seat however, the proximity to the lavatories and galleys may be bothersome. 24 J None No Power Seat 24 J is a standard Economy Plus seat however, the proximity to the lavatories and galleys may be bothersome. 24 K None No Power Seat 24 K is a standard Economy Plus seat however, the proximity to the lavatories and galleys may be bothersome. 24 L None No Power Seat 24 L is a standard Economy Plus seat however, the proximity to the lavatories and galleys may be bothersome. 27 A None No Power Seat 27 A is a standard Economy Class seat that has extra legroom due to the exit in front however, the protrusion of the exit door may be slightly bothersome. This seat is also missing a window. 27 B None No Power Seat 27 B is a standard Economy Plus seat that has extra legroom due to the exit in front however, the proximity to the lavatories and galleys may be bothersome. 27 C None No Power Seat 27 C is a standard Economy Plus seat that has extra legroom due to the exit in front however, the proximity to the lavatories and galleys may be bothersome. 27 J None No Power Seat 27 J is a standard Economy Plus seat that has extra legroom due to the exit in front however, the proximity to the lavatories and galleys may be bothersome. 27 K None No Power Seat 27 K is a standard Economy Plus seat that has extra legroom due to the exit in front however, the proximity to the lavatories and galleys may be bothersome. 27 L None No Power Seat 27 L is a standard Economy Class seat that has extra legroom due to the exit in front however, the protrusion of the exit door may be slightly bothersome. This seat is also missing a window. 29 D None No Power Seat 29 D is a standard Economy Plus seat that has extra legroom due to the position of the bulkhead however, the proximity to the galley may be bothersome. 29 E None No Power Seat 29 E is a standard Economy Plus seat that has extra legroom due to the position of the bulkhead however, the proximity to the galley may be bothersome. 29 F None No Power Seat 29 F is a standard Economy Plus seat that has extra legroom due to the position of the bulkhead however, the proximity to the galley may be bothersome. 38 L None No Power Seat 38 L is a standard Economy Class seat that is missing a window. 39 A None No Power Seat 39 A is a standard Economy Class seat however, there is limited overhead storage space. 39 B None No Power Seat 39 B is a standard Economy Class seat however, there is limited overhead storage space. 39 C None No Power Seat 39 C is a standard Economy Class seat however, there is limited overhead storage space. 39 D None No Power Seat 39 D is a standard Economy Class seat however, there is limited overhead storage space. 39 E None No Power Seat 39 E is a standard Economy Class seat however, there is limited overhead storage space. 39 F None No Power Seat 39 F is a standard Economy Class seat however, there is limited overhead storage space. 39 J None No Power Seat 39 J is a standard Economy Class seat however, there is limited overhead storage space. 39 K None No Power Seat 39 K is a standard Economy Class seat however, there is limited overhead storage space. 39 L None No Power Seat 39 L is a standard Economy Class seat however, there is limited overhead storage space. 4 A None No Power Seat 4 A is a standard Business Class seat that transforms into a fully flat bed. It is missing a window. 4 L None No Power Seat 4 L is a standard Business Class seat that transforms into a fully flat bed. It is missing a window. 40 A None No Power Seat 40 A is a standard Economy Class seat in the last row of the aircraft. The proximity to the lavatories and galley may be bothersome. There is limited overhead storage space. 40 B None No Power Seat 40 B is a standard Economy Class seat in the last row of the aircraft. The proximity to the lavatories and galley may be bothersome. There is limited overhead storage space. 40 C None No Power Seat 40 C is a standard Economy Class seat in the last row of the aircraft. The proximity to the lavatories and galley may be bothersome. There is limited overhead storage space. 40 D None No Power Seat 40 D is a standard Economy Class seat however, there is limited overhead storage space. 40 E None No Power Seat 40 E is a standard Economy Class seat however, there is limited overhead storage space. 40 F None No Power Seat 40 F is a standard Economy Class seat however, there is limited overhead storage space. 40 J None No Power Seat 40 J is a standard Economy Class seat in the last row of the aircraft. The proximity to the lavatories and galley may be bothersome. There is limited overhead storage space. 40 K None No Power Seat 40 K is a standard Economy Class seat in the last row of the aircraft. The proximity to the lavatories and galley may be bothersome. There is limited overhead storage space. 40 L None No Power Seat 40 L is a standard Economy Class seat in the last row of the aircraft. The proximity to the lavatories and galley may be bothersome. There is limited overhead storage space. 41 D None No Power Seat 41 D is a standard Economy Class seat in the last row of the aircraft. The proximity to the lavatories and galley may be bothersome. There is limited overhead storage space. 41 E None No Power Seat 41 E is a standard Economy Class seat in the last row of the aircraft. The proximity to the lavatories and galley may be bothersome. There is limited overhead storage space. 41 F None No Power Seat 41 F is a standard Economy Class seat in the last row of the aircraft. The proximity to the lavatories and galley may be bothersome. There is limited overhead storage space. 5 K None No Power Seat 5 K is a standard Business Class seat that transforms into a fully flat bed. The close proximity to the galley and lavatory area might be bothersome. 5 L None No Power Seat 5 L is a standard Business Class seat that transforms into a fully flat bed. The close proximity to the galley and lavatory area might be bothersome. 6 A None No Power Seat 6 A is a standard Business Class seat located at a bulkhead that transforms into a fully flat bed. The close proximity to the galley and lavatory area might be bothersome. 6 B None No Power Seat 6 B is a standard Business Class seat located at a bulkhead that transforms into a fully flat bed. The close proximity to the galley and lavatory area might be bothersome. 6 D None No Power Seat 6 D is a standard Business Class seat located at a bulkhead that transforms into a fully flat bed. The close proximity to the galley and lavatory area might be bothersome. 6 E None No Power Seat 6 E is a standard Business Class seat located at a bulkhead that transforms into a fully flat bed. The close proximity to the galley and lavatory area might be bothersome. 6 K None No Power Seat 6 K is a standard Business Class seat located at a bulkhead that transforms into a fully flat bed. The close proximity to the galley and lavatory area might be bothersome. 6 L None No Power Seat 6 L is a standard Business Class seat located at a bulkhead that transforms into a fully flat bed. The close proximity to the galley and lavatory area might be bothersome. 7 B None No Power Seat 7 B is a standard Business Class seat that transforms into a fully flat bed. 7 E None No Power Seat 7 E is a standard Business Class seat that transforms into a fully flat bed. 7 K None No Power Seat 7 K is a standard Business Class seat that transforms into a fully flat bed. 8 A None No Power Seat 8 A is a standard Business Class seat that transforms into a fully flat bed. 8 B None No Power Seat 8 B is a standard Business Class seat that transforms into a fully flat bed. 8 D None No Power Seat 8 D is a standard Business Class seat that transforms into a fully flat bed. 8 E None No Power Seat 8 E is a standard Business Class seat that transforms into a fully flat bed. 8 K None No Power Seat 8 K is a standard Business Class seat that transforms into a fully flat bed. 8 L None No Power Seat 8 L is a standard Business Class seat that transforms into a fully flat bed. Individual 110v power ports and USB ports are available in Polaris. In Economy Plus and Economy, 110v power ports are shared between seats and USB ports are at the bottom of the seat back monitor at every seat. The United Airlines Boeing 787-9 aircraft are some of the most technologically advanced aircraft flying. The aircraft are generally used on international long haul routes. Polaris, Economy Plus and Economy seating is available. Polaris class on this aircraft features a standard Business Class seat which transforms into a fully flat bed. Polaris inflight service is offered. My seat was 3A. It was okay but feels too narrow for Business Class seat. My height is only 5.5 (about 168cm) and weight is 140 pounds(63kg). To be fair, I fly only Business or First Class internationally with Emeirates, Lufthansa, Asiana, Austrian, Americans, JAL. So far, United Business is the worst seat. Even you have to jump over other passangers when you go to the toilets. United has 2-2-2 seats for the Business Class feels very narrow than most other airlines Business Class. I think United should change the seat 1-2-1. This is one of the best business class seats on the aircraft. Seatguru's is wrong.... the lavatory isn't close. there is no noise from the galley. Most importantly, the bulkhead seats have huge footwells. I'm 6'3" and was able the stretch out with room to spare. Great legroom overall. No comparison by far. Got lucky to not have anyone in the middle row, so cannot complain about having an extra tray table and seat to keep stuff needed during the flight. Flight attendant jump seat is right in front as well as the restroom. Pros: - legroom, virtually 'infinite'! Cons: - keep getting bumped into by fellow passengers moving up and down the aisle, more so because it is the last row before the restrooms - adjacent to the galley used as staging area for meals, so risk getting smacked on toes by carts and flight attendants trying to rush through the meal service - congregation area for restrooms and people looking to stretch. - restroom smells can wander your way, if you are unlucky. In nearly 18 hours I was here, I smelled the restrooms maybe only twice though. - can be a bit colder initially here due to exit but will warm up once they adjust the heat on board. Definitely a 'Yellow' seat; you get some but you lose some here as well, decide what's more important based on Pros/Cons I mentioned above. NB the arm-rests on this row are fixed (the entertainment system folds out of them), so cannot be lifted to allow you to lie horizontally across them should 1/2 of the neighbouring seats be unoccupied. -9 version of 787 in Polaris has seats right next to each other with a fairly massive divider at shoulder level and an extending divider/table that can easily be stepped around. Seats are the same in the -9 as in the newer -10 version and lie flat in a fairly CAT scan like tunnel. Wouldn't want to be over 200 lbs or taller than 6 feet. Have to take off shoes as space narrows above the foot stool where bed joins. An infinity of settings for the seat going from full up to fully flat allows for easy change to allow muscles not to cramp. As the aircraft itself is the quietest plane out there with the best in-flight air quality, the very comfortable seating makes it a wonderful ride. Even with a lav right behind these two seats, not an iota of passenger noise with a full first class section nor any galley noise was heard during the 4 hours. As a 6'1" guy this was great. The extra legroom was fantastic and very much worth the up-charge on the LAX to Narita flight. The flight wasn't bad at all. The seat was pretty comfy but still a bit narrow. This seat (along with 1A/6A/6L) should be GREEN. Because of the significantly wider foot area, these are the best four seats on the aircraft, especially if you are taller than 5'6". The aisle seat separates you far enough that the noise of the galley/head are unnoticeable. The biggest bonus is that the foot area is not tapered to fit under the seat in front of you, hence quite wide and you can fit your entire backpack under the ottoman, hence anything you store on the floor will not interfere with the movable footrest. Seat 27C is an exit row seat and has extra legroom, but is narrower than a standard E+ seat because the arms hold both the pop-up tray and the AVOD screen. There is no underseat nor any other storage space. The extra area due to the presence of the exit door is very large, and passengers will congregate there to talk. It is also opposite the galley and FA's leaving the galley will bump into you. Also passengers will congregate in and outside the galley forcing passengers from the rows behind you to bump into you as they walk to the lav. I rate this seat red. Some of this would apply to 27A and 27B other than the bumping part, and the seats on the opposite side of the aircraft. This seat hardly went back at all and was very uncomfortable for a 9 hr. trip. We lucked out and had no one in middle. I found this seat to be narrow and not anything like what I expected on a Dreamliner. I sat next to my husband who was in 1A at the window, but it would have been very close if it had been a stranger. These seats are also just behind the galley which was loud and made it impossible to really relax or sleep. We just took the same plane on Air Canada from Vancouver to Frankfurt and the experience was so much better. They had pods so basically - one seat where United had two seats. United's configuration is 2 - 2-2 where Air Canada's was 1 - 2 - so 4 seats where United crammed 6. The Air Canada plane had so much more room and so much nicer. I would gladly go back to the 747 or an A-380 for a much more comfortable and roomy seat and not being on top of your neighbor. If you are paying for business class to Europe - check out Air Canada or Lufthansa who both provide better food, service and seats. I wouldn't fly this plane again in Business unless it was really inexpensive. overall a very confortable seat. The footwells in the bulkhead seats are much wider than the others and make for a much more comfortable sleep. I don't understand why United don't have curtains between the cabin and the galley. As others have mentioned the light in front of the cockpit door is very bright and can be irritating. They have attempted to compensate by a small curtain high up directly in front on the light but it's the general brightness which is annoying and would be easily resolved by a seperation curtain as all other airlines have. Sleeping with an eyemask is mandatory in this seat. Service and food were excellent. Granted, there is more legroom in Y+, but... the 787 was originally engineered for 8-abreast and airlines (except NH) are squeezing 9 abreast; the unescapable result is a VERY narrow accommodation, with ridiculously narrow aisles and seats. Besides, the recline, even in Y+ is ludicrous. In the end, 15.5 hours SFO-SIN comes close to violating the 8th amendment. The seat is reasonably comfortable. However, the shoulder reading light is so poorly designed as to be useless. Such light (usually a rather long flexible tube allowing personal adjustment) is a standard of business class seats, but on this plane, it is located... behind the seat back! which totally masks the light except when significantly or fully reclined. Ceiling reading light is not adjustable, so this makes reading a book or working on a paper notepad next to impossible. This design is totally asinine; even a 6-yr. old would understand that this represents an unacceptable goof in design. On the flight to Sydney, I had 1K and 1J to myself. Made the bed in 1J but it didn't help because the FAs kept opening and closing the storage are in the center row, which had a bright light that was come on when the door opened. There is a big table in front of the seat which makes the seat much comfortable than the others. Pretty comfortable, behind the bulkhead and nothing annoying. Sitting in economy for 11 hours from San Francisco to Incheon was TORTURE. 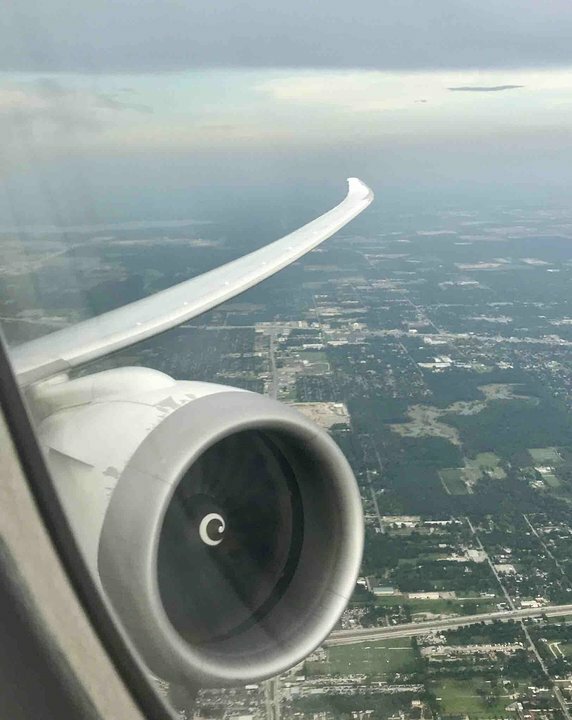 I thought the Dreamliner would be comfortable, but in 25 years of international flying, this was the most uncomfortable flight of my life. Reasons: 1) All economy seats only recline an inch at best, so you have to sit bolt upright for 11 hours. 2) Economy seats don't have those small adjustable footrests any more. If you have short legs like me, your back will quickly be killing you. 3) Seats are quite narrow for an international flight. 4) I never did manage to find a reading light--perhaps there isn't one since the ceiling is so high in the Dreamliner. But they turn the cabin lights out for most of the flight, so don't bring any paper books to read. 5) The new seat shape makes it impossible to use a pillow of any kind, while also eliminating the old possibility of resting your head on the edge of the neighboring seat. Moral: if you are very tall and looking for an economy section where no one can recline their seats, you might like this plane. Otherwise, AVOID it for long flights. This plane lacks everything that used to make long-haul flights bearable. My favourite seat in my favourite plane. Dreamliner has it all, for me. 16J is great, too. Extra legroom at the bulkhead behind Business Class. Food tray in the armrest doesnt bother me at all. 16J does have overhead storage plus extra legroom. And I love the Dreamliner! Infant bassinette can be in use but Ive had no trouble with it so far. 16J is my favourite seat. 1st row behind Business Cl, extra legroom. There IS overhead storage. This is the row where infant bassinettes go but ive yet to have an issue due to it. Since United has done away with first class, will they at least make the business class product like on the 777-300? Climbing over another passenger to get to the lav is not something that should come with a $9000 fare. Sorry, but any seat that requires you to climb over another passenger to exit, which you do often on a very long haul, is NOT first or business class. Why doesn't United put in the Polaris like on the 777-300? Anyone who is complaining about ANY Polaris seat on this plane is delusional. If you have the chance to fly 15 hrs in a lie flat seat, be happy and enjoy it. Don't complain about well size and things like that. The food could be a bit better but otherwise this is as comfortable a ride you can get in any business class. I decided on a whim to upgrade to E+ and I'm glad I did because every extra inch on a long flight is worth it. It wasn't the best flight of my life but it was worth what I paid. I decided on a whim to upgrade to E+ and I'm glad. Every inch of extra legroom is good on such a long flight. Another benefit of E+ is just being in a smaller cabin. It wasn't the best flight of my life but worth what I paid. Avoid seat 24C at all costs. You will have to endure constant bumping of your seat mostly have other passengers to and from the bathroom. Also some passengers waiting in line for the bathroom assume its ok to use the back of your seat as a wall to lean against. Don't plan on any peace and quiet in this awful seat. 24L is an Economy+ seat and provides plenty of leg room. Its close proximity to the restroom is both a plus and a minus. The fact that there is no row behind you prevents the normal kicking and pushing of your seat from behind. The big minus is the occasional odors coming from the restroom. Overall for a long haul flight it's a good seat. The shelves and storage in 5D is much more narrow than the same type of seat in 6D. You cant fit a laptop in the shelf or fit a backpack in the under seat storage. We sat in row 6, seats 6K and 6L and while the seat is very comfortable, the engine noise from the plane is overwhelming. usually 787 is a quiet plane, but this row is right above the engine hoist and absorbs all the vibration. It was extremely uncomfortable and impossible to sleep. The forward cabin has 70% less noise, as doest economy. Even one row back was better. It is a bulkhead, so you get a decent amount of legroom. But in addition to the comments you provided, it's really important to note that the curtain that separates economy from business will slap into you every time anyone moves through there. Overall a very pleasant way to travel. Narrow footwell, but that applies to every business class seat on this aircraft except rows 1 and 6. The biggest downside is that this seat shakes when people walk up and down the aisle. I have read other reviews that say the same thing, about other seats in the forward business cabin, so it seems to affect more seats than just 2D. I'll try the rear business cabin next time. Despite their closer proximity to the galley in bulkhead rows 1 and 6, these seats offer a larger foot well than other business class seats. 6E is situated most rearward of the galley and because of the seat location you do not experience glare from overhead lighting in the galley. I am 6ft3 230lbs and paid for the economy plus seating. I was on a 10 hour flight from London to San Francisco. These economy plus seating had so much leg room. I cannot understand hour people can complain that there is not much difference in regular economy. This is an excellent option if you need leg room. I also had this same seat on the way to London from San Francisco. For me, it was worth every penny. Recommend making this seat red. Leg rest is tiny and barely fits feet. Sent in a photo. No room for bag under foot rest like other rows. I would take lavatory, no window or anything compared to this. Flew both legs (US to France, France to US) in 4D. The seat itself isn't too shabby. Let's list the cons, since there are less, first: The audio jacks appear to get worn quickly. Mine had scratchy sound for movies and entertainment. The seat isn't terribly convenient to sleep in on your back if you're 5'11" due to narrow foot wells, but it's not terrible. The controls can be a little erratic, but that might just have been a single seat issue on the outbound flight. Pros: Decent padding, at least for at 7-9 hour flight. The screen for entertainment was nice, sharp. The ability to choose positioning meant you didn't get stiff. We were able to sleep successfully and begin our trip in France rested and ready. Upper storage easily fit my IATA hard side carry-on, backpack, and jacket with room to spare. Service: The staff on both trips seemed to be conscientious and trying. There is a bit of lag, as this is the last seat row for one set of flight stewards, so you are last ones this group serves. It wasn't terrible, and I did get my primary meal selections both times. That being said, there was a good amount of lag time during lulls. Solved that by hitting the call button when they weren't busy for a meal service. The operative rule appears to be if you want service at a non-standard time, hit the call button. They don't roam the cabin checking often. Food/Drink: Passable. This is airline food, and the ticket was not terribly expensive considering the other options. Value for money is reasonably close, but they could step it up a bit. As far as drinks, the wine and champagne were ok, but I am not a connoisseur to truly be able to judge. Great seat. I moved there from Economy Plus because I wanted a view of the ground, and all the EP seats are over the wing. Alas, the crew kept darkening my window, even though it wasn't night, which was disconcerting. I posted a full review in "Crew vs. View..." here: http://bit.ly/crwview. The only thing negative I can say about this aircraft is that the foot well is for a midget. There is so little room for one's feet that it's very difficult to sleep. The crew in business class and the food were both outstanding. The seat was very comfortable. Entertainment cent was great. Mood lighting exceptional. If I were to do it again, I would select ANY of the seats in row one. These are the best on this plane. This seat has a narrow footwell which wasn't terrible, but mildly uncomfortable for my size 11 feet. Additionally, the United 787 has older seats that are not the latest Polaris business class seats. Because of this, when I have the option I'll choose the 777-300ER since their business class seats have wider footwells and are the newer Polaris seats. Thin seats aren't as bad as 787s flown by some other airlines, but the narrow width means shoulder to shoulder action when you're stuck in the middle. At least the legroom in Econ+ is decent. There are two US power outlets per row, and IFE also offers USB. I think this is a good seat. I have had this same seat 3 times SFO-LHR. It does not suffer from the galley or toilet noise. Don't forget to specifically ask for new Polaris mattress pad and better pillow. We flew SFO to SYD in 6DE, and back in 3DE. For a couple who both want direct access to aisle, these are the two best seat pairs. But very different. 6DE has bulkhead seat footwells that offer dramatically more foot space when sleeping. They are just much better, and now downside. EXCEPT, they are right behind the Door 2 galley and so are indeed quite noisy and bothersome during the entire flight. UA boards this plane through door 2, so except for the 30 people in the front, everyone else in the plane boards walking beside these seats if you board early. On the other hand, the regular center footwells are really narrow. I'm 6'1" or just a little less, and I can only sleep in the row 3 seat on my side and slightly bent up. In row 6, I can sleep fully stretched out on my back. And the front cabin is much quieter, and row 3 being half way between the two galleys is the most quiet. YMMV in other words. If you value sleeping length, row 6 is awesome. If you value peace and quiet, row 3. So, I think the row 6 seats should be coded half yellow / half green, including a comment about the much larger footwells. The space and the pitch were good enough for a 1,70M tall man like me. Entertainment was good and the food was tasty. An American airline isn`t a Gulf States airline like Qatar or Emirates but they are ok. I recently flew United from Los angeles to Melbourne, AU with a flight tome of 15 hours and 50 minutes. 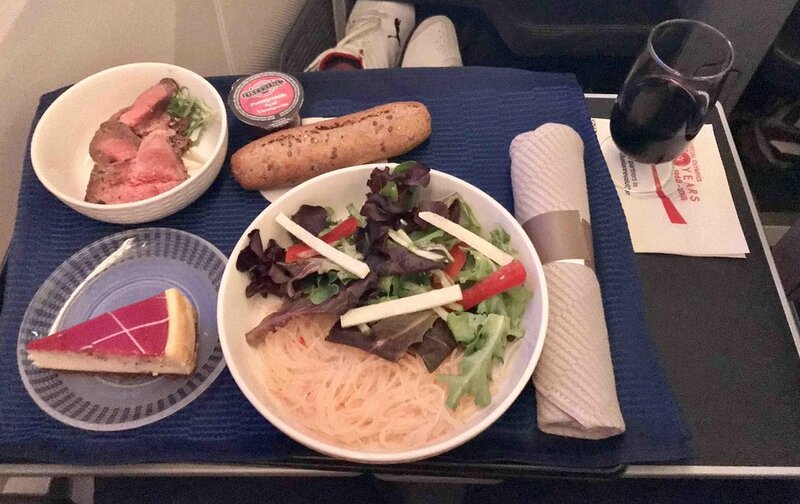 I was seated in United Polaris Business Class seat 8A and was extremely comfortable from the moment I was welcomed onboard to the moment I stepped off the aircraft feeling refreshed. Not only is the 787 a comfortable plane to fly on, United makes the experience even better. 787 economy seats are horrible. Very narrow (much narrower than B777 or Airbus A 330, and padding is virtually non existent. This was supposed to be a 777 flight but 787 was substituted after we made our reservation. I would rather add a connection than fly this plane. I was not bothered by the proximity to the galley and bathroom, nor the little "bar" they set up in front of the seats. The real advantage to this seat and all in the bulkhead rows (rows 1 and 6) are the MUCH larger foot wells that are just about as large as the seat itself. Seats 1D and 6D have slightly larger foot wells than 1E and 6E. Because of this, I think the seats in rows 1 and 6 should be yellow/green rather than just yellow. I am a 6 feet tall woman (181 cm) with very long legs, and this seat was pretty comfortable length-wise. I always have to adjust myself, and sit slightly sideways. Not a problem on this flight. The crew was very nice. DEN to SFO. June 12, 2017. First time of 787....what a great plane. Seat 1E had lots of room including the footwells. Would be great for overseas flights. No issues with bathrooms or crew. The seat is set back from those areas. Book this plane if you have a chance. For a change, nothing negative to say about a United flight. Food good, service good and the seat was terrific. The seats in econ and econ+ do not recline. They just roll up a little to make you think you reclined. Terrible for a long-haul flight. United had turned the Dreamliner into a Nightmareliner! I am a United million miler and have never had a worst flight on UA. Couldn't sleep at all in this seat, a first for me. This was a good seat. 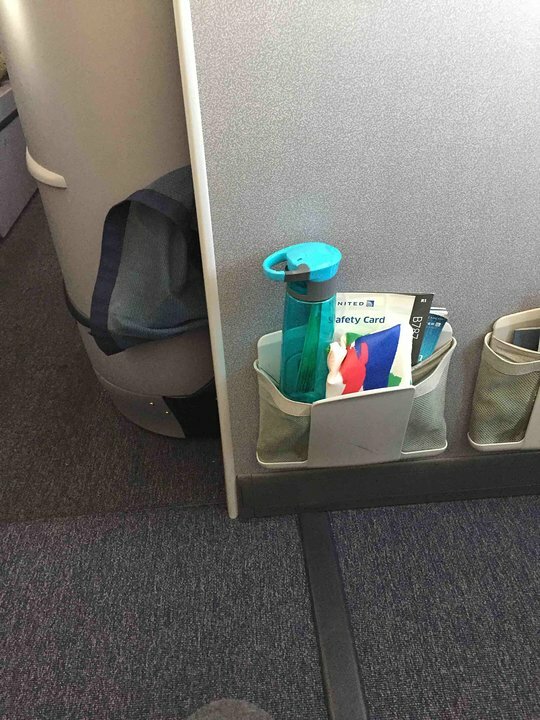 As previous comments said, there is a drink station/place to store bottles of wine and water in the bulkhead in front of the seat. Yet unlike one of the previous comments, I didnt notice any vibrations from people picking up and putting bottles down. First time on the 787 - think 777 is more comfortable. Narrow isle. Seat needs more padding. Occasionally arm/elbow knocked by crew member because of the narrow isle. Perhaps United should select crew who are of a slim build! In no hurry to fly the 787 again. I loved this seat, massive amount of legroom. Flying back from SYD-SFO i had originally booked 23C and changed it last minute to 16F when it opened up. Pros: -unlimited amount of legroom -1st to get meals and drinks -you wont be bothered when the person next to you needs to get up. -no one will be crowding around this seat Cons: you get to enjoy your economy seat while looking at the comfort of Polaris lol. TV is in the armrest, so no headstart on movies(since it has to be stored for taxi/landing) I would highly recommend this seat for anyone who loves legroom!! This is the lousiest economy class for a super long haul 17 hour flight from San Francisco to Singapore. It's cattle class, in short. Seats are very tight. Leg room ok for a short guy like me. If there is a big size guy sitting next to me, it will be hell for us for 17 hours. The economy seats can hardly recline. Not to mention 17 hour flight. It's difficult even for 7 hours. No legrest. Very little food is provided for such super long haul flight. Only 2 miserable meals with negligible selection of snacks en route. A 9 hour flight on American Airlines provides far much more food than a 17 hour flight on United. No refreshing towels and souvenoir. Put United CEO in such a cabin, and I bet him jumping out of this aircraft within 2 hours. It's time for United Airlines to re-examine itself and repent, and the CEO to resign. Otherwise, it'll lose all its customers, especially for long haul. The Dreamliner is one great plane! This trip i was in 29D. I wanted the bulkhead and thiught this row did not have a baby bassinet... It did . Actually, it was just fine. There absolutely is overhead storage, near but not on top of the lavatories,a good location all in all. Seat was comfy enough though I don't require extra legroom. The seats in Premium Economy have extra leg room, there is plenty of overhead storage space and I did not see anything limiting under seat space, so space for my legs and feet was adequate. HOWEVER, beware that the seats and aisles are narrow. Every time a FA or passenger went by, I would get bumped. Fortunately, there was no one in the middle seat or it would have been even worse. Terrible recline. Not only does it not go back far, my seat kept on resetting itself to the upright position, and I had to keep on reclining. Worse than the seat were the staff. The seat is way too narrow for a long haul flight. It's been a long time since I've flown long-haul with United, and hopefully it will be a long time before I have to fly with them again! 14 hours in the air, and not once did I see one of the staff smile. You felt like you were an inconvenience just being on the plane. This crew definitely modelled the stereotype of United staff! No music entertainment is available on this aircraft (nor on 777s nor 757s). There are movies and tv and some obscure radio podcasts. United'music contract expired on 31 Jan and was not renewed. Also seat pitch on thius aircraft is only 4 inches whilst on United 757s it is 6 inches as it is on most BA and other premium economy seats. I found this seat extremely uncomfortable and the aircraft extremely unpleasant for a 14 hour flight. I found this seat very uncomfortable as the flight was delayed and I was sat in it for 15 hours.Very hard and poor recline compared to a 757 flown the previous day.Generally found the dreamliner too small for long distance travel.Also crew did not know how to operate air vents. My most unpleasant flight on United ever. Sat in row 34l (window) seat SFO to Sydney. Contour of window helped some with room. Sat in row 34l returned trip. Did not have the contour of window and was very tight. Leg room not bad but limited foot room. The light directly above the cockpit entry will shine in your eyes. Half of the overhead bin is used to store pillows and blankets. There are several storage lockers which the crew will open and close noisily in the galley right in front of this seat. This seat has a wide footwell but no overhead compartment for storage. Recently flew this aircraft from SFO to SIN. Leg space for this Econ Plus seat was good. However there was no foot rest, in fact same for all the seats in Economy/Economy Plus. It would be good to have 4" recline as published; I was only getting like 2" to 3" recline, no difference from the standard Economy seat. Very disappointed. There is a light in the hallway by the cockpit that is very bright throughout the flight (it's able to be dimmed but they can't allow that). There is no curtain to block this light. This creates incredible eye strain when you're trying to watch the TV in the dark and/or fall asleep. The flight attendants told me that many people complain about that seat. I have a picture of my experience. Window seats in the new polaris business class have less feet room width under the monitor. You loss about 1/3 of the width verses the other seats. So, if you have big feet, or even want to turn them sideways while sleeping, this is not the best option. The seat does have overhead storage but it does not have underseat storage as it is bulkhead. This seat is sold as Econ+, great seat if you like legroom. Be aware though, this seat is not as wide as the standard economy seat since your tray table, and TV are in your armrest. You lose a good .5-1inch of seat which makes the seat very narrow, and with no storage its kind of a pain in the @ss when it comes to storage. the restrooms are more of a distraction then the galley. Galley is only used during meal time, other then that is usually empty. Recently flew this aircraft roundtrip LAX-MEL. As others have noted, if you are a solo traveller its best to try to grab an aisle seat in the center section of two. I found that this was a worthwhile tradeoff to having a window seat, as it meant complete freedom to get up to use the lavatory or stretch one's legs without having to awkwardly climb over a seatmate. Its also better than the aisle seat in the window pair, as this means someone will be constantly climbing over you. This makes a big difference on ultra long haul flights such as these. I prefer the smaller mini cabin of three rows, 6-8, feels more private. The bulkhead rows of 1 and 6 do have a much larger footwell, which makes sleeping more comfortable, however they are also closer to the lavs and galley which will mean more traffic passing by in the night. Service was excellent, loved the increased humidity, better cabin pressure and nice mood lighting during the night. Well done, United! Agree that seats near the galley are prone to disturbance. Otherwise good cabin crew are noisy in the galley, talking among themselves and banging carts. I was very ex'cited about Uniited's new 787 service SFO to Tel Aviv non stop thus eliminating a bothersome stop in Newark. Now that I have experiencedthat flight, i just may go back to the old route. My Business/First experience from SFO was pretty good and I was intrigued by all the new ""gadgety" stuff. Really liked the large bathroom at the rear of that cabin. Coming back in Economy Plus, however, was about the worst experience ever. I was in seat 17A , the narrowest seat I have ever experienced. Also, it did not recline, not sure why. So, 15 hours squeezed into that seat with a 250 plus man in the middle was torture. His extension into my area made it even narrower. I couldn' even use my eating utensils. I never had that kind of squished feeling on a 747. I am now thinking i would rather have to travel a few hours longer with making a stop but in more comfortable seats than being tortured for 15 hours. Oh, and the sevice was not great. This business class seat seems to have what i regard as a serious flaw. On my aircraft (3950) the seat gets a lot of annoying impacts. At first i thought the person behind me was banging the seat. But it turns out the banging comes from flight attendant footfalls in the galley! Perhaps an installation error. I am on this type aircraft often and wont take THIS seat again. Very comfortable. Feels like more than 32" seat pitch. Had around 2" between my knees and the seat in front of me. In business class, the right hand seat in the middle pair of two seats have narrow footwells compared to the left hand seat. This seat is best suited for sleeping on one's back. This does not apply to the bulkhead seats. This seems to me to be a yellow condition. The bulkhead seat has a significantly wider space for your feet compared to regular seats due to the location and is now my preferred seat on the plane. The most uncomfortable and confined seat ever in economy class, not much better in economy plus. A very noisy aircraft, especially in economy. 6D, 6E, along with 1D, 1E, are the best BusinessFirst seats for the solo traveler. Their bulkhead position gets you a footwell that is the full width of the seat, vs. a small triangular footwell in standard seats. Noise and light from the galley is not noticeable enough to be an issue. Proximity to economy class bulkhead just behind business class row 8 means you are likely to hear babies crying. 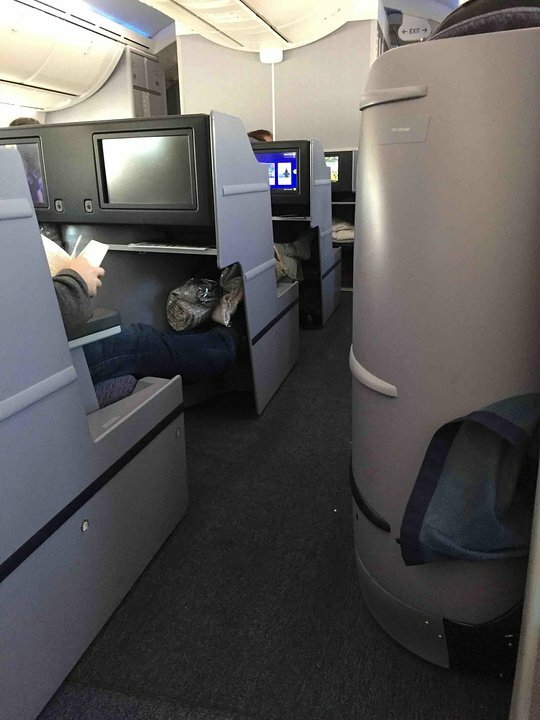 The footwells on the the 787 bulkhead seats are twice as wide as all others in business, rows 1 and 6 are much more comfortable if you want more room to spread your feet apart. This is true of all 787 that United has including routes to Osaka, and Shanghai. I fly 500K miles a year and always ask for row 1 or 6 on united if I am on the 787. Contour of the airplane makes the seat feel cramped. The legroom is adequate, but business class passengers wandering around for their evening stroll tended to step on my feet. One even flicked the class dividing curtain as he went past and left it draped over my entertain screen and lap. The seats are way too narrow. I'm a six footer of average (not fat) build and my hip kept switching on my reading light and calling the flight attendant. In the middle of the night, the reading light disturbed the another traveler's infant sleeping in the bulkhead bassinet - the called flight attendants weren't a disturbance since being United (with a Continental crew) they only showed up once anyway. The 787 is a beautiful aircraft - its unfortunate that United's "cram-'em-in" seat configuration and 707 era cabin crew ruin the 787 experience. The economy seats on this plane are too narrow. 10 hours of bashing your elbows against your neighbour, not fun. 3-3-3 on the 787 is just too narrow. Thankfully I got either an aisle seat or window seat. Middle seat must be even worse. 2-4-2 on the A330 is much nicer. My husband and I took this flight from LAX to Melbourne, Australia. Your pleasure in these sits will depend on your what you are most important do you. My husband is 6ft 4in. So the extra leg room for him was great. Some people may be bothered by the noise from the bathroom and galley. Not to mention sometimes a few people waiting to use the bathroom. I have a hard time sleeping on a plane period so these things didn't bother me. But headphones and a sleepmask would work wonders. I would prefer sitting in this seats with the option of getting up to go to the bathroom or stretching any time I wanted. These seats do recline and have a tray and video screen in the arm rests. The arm rests do not go up. I didn't mind it since it gave definition of my space and the person in L. (I do not recommend 27L for a taller person since door protrudes into the leg room. )Although the itinerary said we were only getting dinner we did receive breakfast as well about 1 hour before landing. Nice! Great seat, and didn't have to fight getting in/out. Here's the deal -- you are on a AIRPLANE, so lying flat sounds like the most awesome thing EVER! Don't get me wrong, it was a great experience (especially the food), but it wasn't the most comfortable bed ever. Having said that, after tossing and turning for over an hour, JUST as I was about to complain to myself, I remembered I was lying flat while some of my fellow passengers were fighting a 3" incline in economy plus! To be honest, I didn't feel much better after a 10 hour flight then if I had been in coach (which I usually travel in)...so your call. It IS a great experience though! Flew Business First round trip from Los Angeles to Melbourne Australis, best flights ever. The United 787 is a truly amazing aircraft!!!! Very Uncomfortable trip with really no recline available. l am not a large build , but felt we were crammed in . Sadly l feel that it was a poor experience. Very little service , with only 2 meals and no snacks provided for such a long flight. No Menu about what food was available , even though they announced at the end of the flight they were collecting them ?! The toilets were unpleasant also, definitely felt this trip was a cheap fare and absolutely NO FRILLS - Not for the weak hearted!! Despite what some reviewiers have said about the 787's 3-3-3 seating, I found the Economy Plus seat 17L quite comfortable. I had the added bonus of two windows for this three-hour morning flight from Houston to Los Angeles. I like looking out the window but in this position the wing blocks all the downward view and the top of the wing-mounted engine blocks a lot of the forward view. Otherwise a comfortable seat. We sat in 1K and 1L, even after reviewing comments about noise from the galley. We had no complaints about noise, and these bulkhead seats are roomy, with a large credenza, and very quiet (far from the engines). First choice of meals and drinks and good in flight with wifi. Would claim these seats again. Seat 1B is decent enough, but beware that there is a light in the front gallery that will shine in your eyes when trying to sleep in the darkened cabin. An eye shade will do the trick if you don't mind using them. One is provided in the amenity kit for long haul flights. A comfortable business class seat on a new Dreamliner plane. Only downside of this seat is the space for your feet which is shaped like a narrow triangle and doesn't leave much room for them. I perused other foot areas and they don't appear to have the same issue. Just the E's. The seat recline is a bit limited but not too bad. Seat width is OK. My problem was with the electronic window shades. You see on the left side of the airplane the sun will be blazing into the window for a number of hours. The electronic shade does not get anywhere dark enough to block the heat from the Sun at high altitude. It literally felt like my head was being cooked! I partially resolved this by tearing the corners from the United Explorer card brochure (large piece of cardboard) and jamming it in the corners of the window. Next time I am cutting up a silver car window shade and taking some tape in my hand luggage in case I get a window seat on the left side. dripping water from ceiling air-conditioning isn't fun. I flew NRT-LAX in the economy plus seats, the reclination is almost non-existent, making a long flight very uncomfortable! If at all possible, AVOID THIS PLANE FOR ANY LONG FLIGHT!!!!!! The seat Width (17.3")is a big problem too!!! Note: I flew 787-8 too, the reclination is better than this 787-9, but the width is the same. This seat has very narrow place for your feet. Much narrower than other seats in BusinessFirst that I saw. I flew NRT-LAX in the economy plus seats, the reclination is almost non-existent, making a long flight very uncomfortable! If at all possible, AVOID THIS PLANE FOR ANY LONG FLIGHT!!!!!! We flew this plane LAX-MEL on a 33 hour journey from TPA to AKL. It was one of the best flights we have ever been on. The crew was great and the extra humidity and lower altitude pressurization of the Dreamliner makes a big difference in the way you feel after the flight. Avoid 1D, 1E on this route. United sets up a mini bar in front of these seats and there is storage drawers that are frequently opened and shut causing vibrations that will disturb your sleep. My family and I travelled on this flight for a family visit to Australia. Six days later we still recovering from the ordeal. I have crossed the pacific roughly 30 times and have never had a flight this bad. 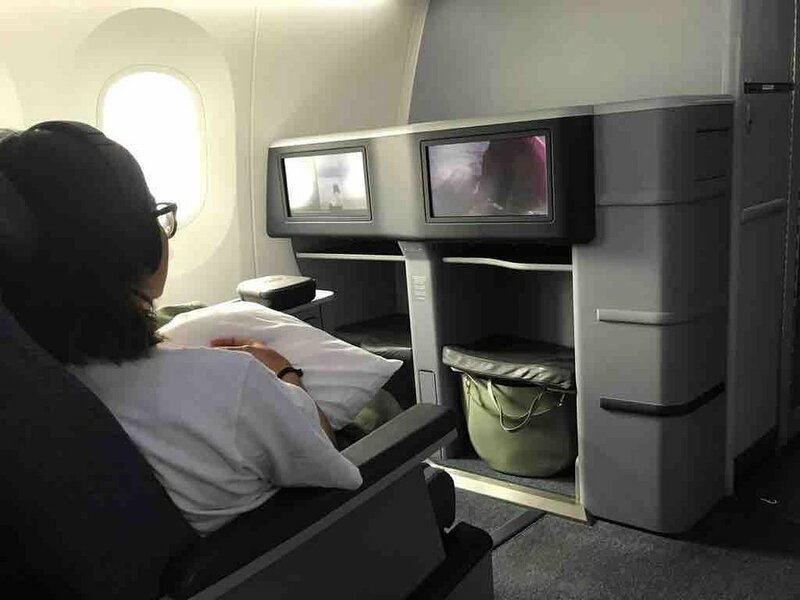 These are middle economy plus seats that do not recline more than a couple of inches, so you will be sitting upright for the entire 15 hours from LAX to MEL. Bring your own food and water as what they serve barely counts as food, and good luck asking for a coffee. If at all possible, AVOID THIS PLANE FOR ANY FLIGHTS LONGER THAN 5 HOURS. Rows 1 & 6 in BizFirst are the best seats as they are "bulkhead" and have extra legroom with the cut-out for your feet. The front cabin is a little larger, but quieter as you are further from the engines (louder the further back you go). United sets up a makeshift bar during the flight in front of 1D & E - which can be nice. If you are flying alone, grab a middle seat, if flying with a partner, grab a window pair. In Economy, row 16 has the most legroom as its also a bulkhead behind Biz. 1K and 1L are right by the area where the flight attendants store bags and other materials they may need during the flight. Although you cannot hear the lavatory, even though it's right there, the constant commotion from the FA storage area immediately next to 1K can be distracting over the course of a 15 hour flight. I was traveling with a friend in 7A and 7B. The smaller back cabin is very cozy and has the advantage of being able to access two bathrooms easily (and the bathroom just ahead is a handicapped bathroom and thus very roomy). I would prefer this cabin to the larger front one, as long as I was not in the last row, which is right up against the coach cabin. 4K and 4B ought be yellow to go with the red of 4A and 4L (no window). The larger windows of the 787 give the passenger next to the window seat a chance to see out. But not at Row 4. Always check whether you are on the 787-8 or the 787-9 on the Dreamliner. Row 5 on the 8 is great but not great on the 9. The 9 has two business class cabins and the second cabin (3 rows) is not as quiet as the first cabin. All middle seats are the way to go both people have access to the aisles. In the past getting the window seat was an issue to climb over other passengers. Because of the windows and the digital lighting you can at least feel that you can look out. Prior to that if you were in a middle seat you had no option if the person sitting at the window closed the window blinds immediately the flight took off If you have BOSE headsets be aware. The double plug of the Bose does not fit into the United plug. It seems that the plugs on the Dreamliner hae been custom made only for the United Headsets which are ordinary and not noise reducing like the Bose. The Bose still works but if there are issues you can only get mono as the double plus will not fit in.As a new aircraft all of these teething problems hopefully will get sort out. United flies 1 versions of Boeing 787-9.